All tucked up for the summer. You might think that the title sounds a bit strange, especially those who live in the more extreme latitudes who are more used to wrapping their plants up for winter. 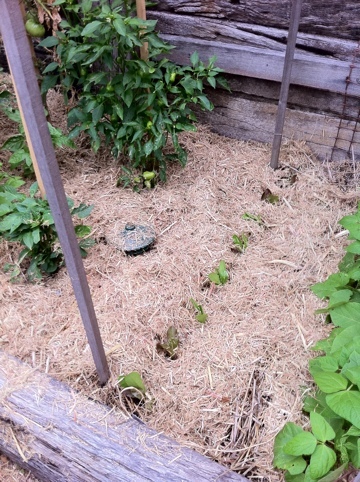 But here in Melbourne the summer heat can get very fierce, and soil that doesn’t have the protection of a mulch soon dries out and forms a crust that become impervious to water. In addition the roots of the plants seem to suffer heat shock and the plant copes less well with the heat. Our days have just started to heat up – so far it has been a mild summer. But now we are into January 2-3 days of temperatures over 35 degrees are not uncommon and I don’t want to be caught off guard. So today I went out and spread a 3-5 cm layer of sugarcane mulch over the bare soil. For those not in Australia you may not be familiar with sugar cane mulch. It is a by-product of the sugar cane industry and the shredded sugar cane makes a good ground cover. Light enough to let water through, light in colour to reflect the heat and relatively cheap, which becomes a consideration when you have a large area to cover. Barley straw is another option but less readily available. So if you are heading into summer heat like me, consider tucking your plants up for summer. This entry was posted on Sunday, January 16th, 2011 at 9:05 pm	and is filed under Summer, Vegetables.